Designed with ninja battles in mind, this sword offers a solid piece of stainless steel with heat treatment and custom black on silver finish. The nylon cord wrapped handle adds a sleek stylish look with easy maneuverability. 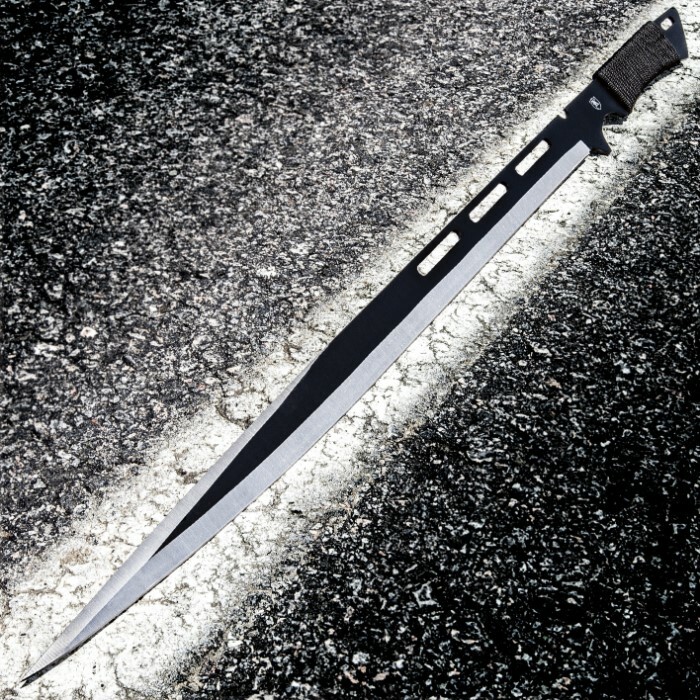 The blade is constructed with futuristic cut outs and comes sharpened. Includes a nylon blade sheath. 27 1/2 in. overall, 19 1/2 in. blade. Took a little longer for shipping than I had expected. In the end though very happy with the choice it looks great on our wall. A novelty sword is a novelty sword. It broke very quickly. When it lasted it was pretty good though. Totally happy with my purchase. It's a very nicely made one continuous piece of steel. The only reason I can think that the description says "Half-Tang" is maybe due to the choil (finger grooves) The list price of $21 is more than fair, $10 is a BudK bargain!!! Focus: This is a defense/display/cosplay sword, not a wood chopping bushcraft sword ( if there is such a thing). NOT designed for chopping, batoning, or throwing. This is made for thrusting/poking/piercing/skewering. Again, not wood, trees, rocks, or concrete. Go for soft squishy targets. Grips - Not a fan of rope wrapped grips on anything on my best days, but Cold Steel uses them too. Glue/Epoxy them or get the grip tape in the color of your choice. Sheath ( Scabbard) - Back off dissing the scabbard!!! Budget knives/swords are famous for crappy sheaths, this is not one of them. It's a nice scabbard. Not a great scabbard, but sword + scabbard -$10!!! I've paid close to $10 for a crap machete sheath with no machete included. 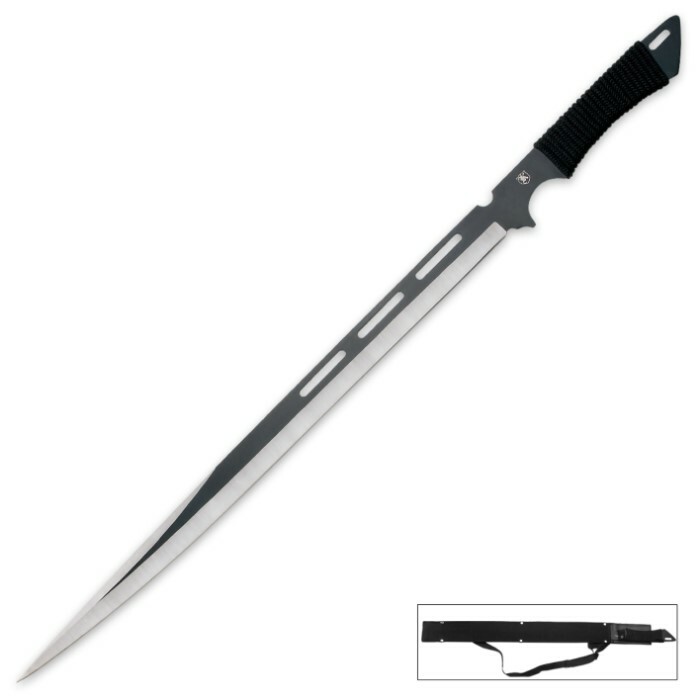 So if you want a well made sword with a needle sharp tip either get this or be ready pay a lot more. This is an amazing product. The blade is light weight and easily transportable, but it has one of the worst demonstration videos. It looked as if the blade was dull and down graded the potential of this item. It was just as I expected and my boyfriend loved it. I would highly reccomend it to anyone who wants a good sword. I bout this sword about 4 months ago and. I love it this one great piece of steel . this sword can cut even when its blunt .All Iam gunye say is this is a great sword. Solidly built sword. Even after several fights with my cousins 10 pound, double handed full tang broadsword, (of which i won many) it did not show any signs of bending. My main complaint is that the nylon wrapped handle unwound very quickly. i just replaced it with electrical tape. Also, it does not hold a edge for long. It didn't come sharp, which is to be expected with most edge weapons, but it was disappointing. It was not even sharp enough to cut the cardboard box it came in. overall, it is a good product. thanks, Budk!